Apple started shipping the first round of Lightning-to-30-pin adapters, at least in Australia. This much-needed accessory enables iPhone 5, iPod touch 5th Generation, and iPod nano 7th Generation owners to use their older 30-pin dock connectors. It will also be clutch when Apple rolls out the iPad mini and refreshes the iPad. According to a MacRumors posting, the Lightning-to-30-pin adapter is scheduled to be delivered on Oct. 9 to its first-known customer Down Under. As handy as this accessory is, it does come at a cost. That lucky first Australian recipient had to pay AUD$35 (US$29, GB£18) for the special accessory. It's even more expensive for the Lightning-to-30-pin adapter that comes with a small cord: AUD$45 (US$39, GB£30). Yes, it's $10 more for a 0.2 millimeter cord. Apple customers will have to put up with those prices for a while. 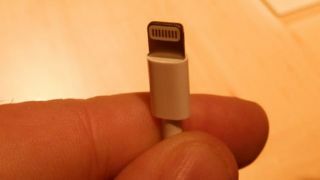 There's a unique hardware chip within the Lightning cable preventing cheap knock-offs from flooding the market. Amazon lists a few third-party Lightning adapter retailers like Nanotch and iTronz, but both have "Currently unavailable" on their respective product pages. Apple has gone as far as to demand approval of all third-party Lightning accessories. So instead of buying a small company's cheap adapters made in China for a third of the price, customers will be forced to buy Apple's cheap (to make) adapters, also made in China, for an inflated price. The good news is that the Lightning cable is here to stay, so the $US29 and $US39 for the adapters can be seen as a 10-year investment.